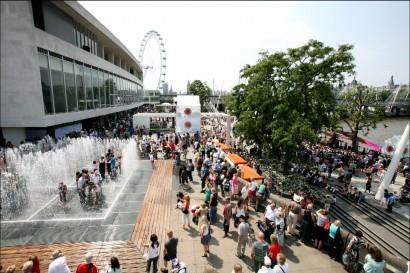 LOCATED by the river’s edge between Waterloo and London Bridge is the Southbank Centre. My first, and up until recently, my only visit to the Southbank Centre was a couple of years ago when I saw Australia’s own Angus and Julia Stone perform at the Royal Festival Hall. It was a great gig and the venue really complimented their understated folk essence. I just sat there and chilled out to their music. This lone experience, though memorable, meant that I only ever thought of the Southbank Centre as a performance venue. Nothing could be further from the truth. Not only does it stage theatre and music gigs, it also hosts a variety of cultural programs, arts festivals and exhibitions throughout the year. There is even monthly wine tasting sessions. One such exhibition is Light Show at the Hayward Gallery. We bought our tickets online for £11. Only upon arriving did we realize our advance purchase was a gift that kept on giving. Saturdays in London are busy, and if you’re looking for some respite, the Southbank Centre is not the place to go. It gets busy. By 10:30am they were already turning people away at the door because the exhibition had sold out. I was left in the dark about what this exhibit would present. Only upon entering did I see the light; a beautiful chandelier-like sculpture with lights glittering in lots of different patterns. I was like a moth to a flame. I stood there for about 10 minutes before dragging my eyes into the next exhibit. The entire light show proved to be fascinating and beautiful, with many memorable pieces of artwork and sculptures. After spending about an hour and a half in the gallery we walked into the light of day and discovered a fresh food market. While it cannot be compared with Borough Market, for its size it certainly offers a lot. There were stalls selling hot cider and hot chocolate, tempting on a cold day, but with the £3 pounds of change we had between us, we opted to buy a delicious brownie and fresh bruschetta as a snack. The light show and market, not to mention the hustle and bustle of the Southbank Centre on a Saturday, may have been a far cry from the peaceful sounds of Angus and Julia Stone, but all-in-all it was a great way to further exploration of this side of the Thames. There is a massive list of what is on in the future – my only problem will be choosing what to go to first.